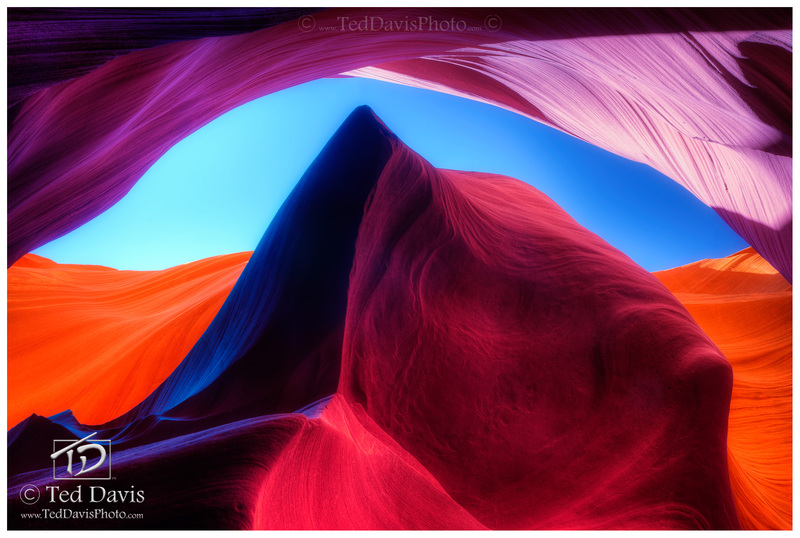 Staring towards the sky of Antelope Canyon, I recognized a scene I had seen thousands of time – that of a wave cresting on the ocean! With the angle of the rising soft morning sun entering the canyon, the colors of the canyon walls were dramatically different. Where shadows played, the dark purples and magentas were reflected in my lens, and where the sun reflected on the rocks, an orange glow dominated the image. Crouching down and pointing my camera towards the heavens, I took shot after shot trying to capture this Swell before the harshness of the light burned away the cool blue morning sky. Photo © copyright by Ted Davis.